The Shard London Bridge (also known as the Shard of Glass) is a skyscraper next to London Bridge Station in Southwark. It is to the south of London Bridge which crosses the River Thames from the City of London to the north to what has been deemed for centuries to be the somewhat bohemian areas of Southwark to the south. Click on Southbank for more information on the district. The Shard has 87 floors and at 310 metres (1016 feet) is the tallest building in the European Union. In the photograph you can see it slightly undressed. Bands like Yes and Hawkwind played with lasers and provided mega impressive displays. They could do this because they were not playing underneath one of the most heavily used air corridors in the world. Under an air corridor any laser pointing up is potentially hazardous to the safety of incoming airplanes (it has the potential to blind the pilot(s)) and is consequentially potentially hazardous to the many properties under the corridor. Secondly, at a music venue the audience is concentrated in one location which makes it easier to illuminate their entire sky. Hmm, not sure how long I’m going to keep this on my site – it comes up with a bunch of adverts at the end. Tickets for adults cost £25. Floors 75 to 87 are within the spire. They will not be occupied but used to radiate away the heat generated by the building. Unusually for a tall building in London many of the floors will be open to the public. These include the viewing galleries and of couse the restaurants. Each use of the tower – hotel, restuarants, appartments, viewing galleries and offices – will have its own separate entrance. The entrance to the viewing galleries is on Joiner Street. The Shard was designed by Italian architect Renzo Piano who is said to have been inspired by sailing ships on the Thames (hmm – big ships) and the spires of London’s churches (they are nowhere near that tall!). The history of the building dates from the purchase in 1998 of the site – formerly the location of a building called Southwark Towers – by a property developer called Irvine Sellar. In 2000 Mr Sellar, in the hope of gaining planning permission for a major development in this sensitive location, travelled to Berlin to meet architect Renzo Piano for lunch and advice. Renzo Piano is acclaimed in some circles for architectural feats such as the Pompidou Centre in Paris and the Lloyds building in London. Both of these buildings have key services on the outside which makes them look different, however this approach to building design exposes the critical services of the buildings to the weather and makes them costly to maintain. Perhaps interesting to look at – but raises the question of what it is for apart from the glitz? Maybe it was this sort of fairground architecture that Mr Sellar was looking for to convince the planning authorities of the case for an immense building on the London Bridge site. Who, in their right mind, would fly to Berlin to discuss the design of a tall building with an architect before settling with the architect that they would be interested in taking on the commission. Lovely story guys – but please pull the other one! If you are to meet with an architect to discuss the design of a building with a construction cost of £450 million, would you really arrange to meet in a restaurant where the architect could simply flip over the menu and draw on the blank reverse side? I think not. Any establishment worthy of the name of “restaurant” nowadays (and then) has classy bound menus. That’s especially true in Berlin where they take a pride in doing such things properly. Wouldn’t the serving staff have something to say about the menu being written on? St Pauls Cathedral – 111 metres. The Shard is built around an extremely strong concrete core which houses all of the key services including escape routes and 44 lifts including dedicated lifts for firefighters. The office floors are serviced by double decker elevators to increase the efficieny of the use of the lift shafts. In case of emergencies there are three sets of stairs and these are supplemented by high capacity evacuation lifts, this approach is common in cities such as Hong Kong. The core is designed to withstand the massive lateral forces exerted by the wind. 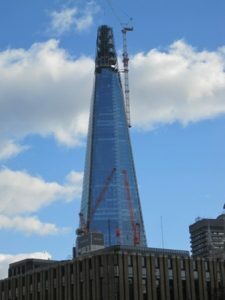 Even with the central core the Shard is intended to move by up to 20 inches in high winds. The design utilises a steel frame for the lower office floors and a post tensioned concrete frame using steel tendons made tense with hydraulic jacks for the higher hotel and residential floor plates. The steel allows for long column-free spans in the office areas and the concrete of the upper floors helps to soundproof the living areas. The upermost levels are steel and a “hat truss” system is utilised which stabilises the building by binding the building’s perimeter columns together. To increase energy efficiency the temperature regulation of the building is aided by the design: the outer layer is triple glazed with sun shielding located between an inner double glazed sheet with controlable louvre windows and an outer single glazed sheet. An intelligent blind control system tracks the position and intensity of the sun and moves the shielding into place when and where necessary. The sides of the elevational planes of the outer layer of glass do not meet resulting in non-mechanical ventilation and the top 15 floors in the pinacle are used to dump any excess heat. The building is clad with a special white low iron content reflective glass intended to enhance the building’s crystalline appearence. 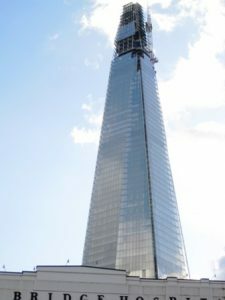 The Shard utilises a Combined Heat and Power (CHP) generator which burns gas on-site to generate both heat and power. CHP can be extremely efficient when both heat and power are required at the same time. This is because CHP eliminates the losses associated with the transmission of electricity from a remote power station and in addition, the heat generated which would normally be a waste product in a power station, can be put to good use in the building. The Shard is also served by two dedicated 20kV high voltage electrical cables from Bankside substation. At ground level agreements (under Section 106 of the Town and Country Planning Act) have been forged between the developer and the London Borough of Southwark to fund regeneration in the area. The concourse of London Bridge Station is being upgraded and linked to the Shard under a new glass roof. Retail units in the ground floor of the Shard will face out onto the concourse. The development also includes a new public piazza and a bus station. Base jumpers have successfully leaped from the structure at least 4 times having bypassed the security measures put in place by the developers. The Shard London Bridge was originally known as London Bridge Tower, however its detractors (which included English Heritage) shot themselves in the foot – they dismissed it as a “shard of glass” and the name stuck. The Shard is a highly controversial structure mainly because of its proximity to so many listed buildings and ancient monuments, and its height relative to the surrounding buildings. It was opposed by English Heritage and local authorities (although not by Southark where the building is located – Southwark stands to gain substantially by hosting such an iconic building which will generate substantial rewards in what are called Section 106 planning agreements, these include regeneration of the concourse of London Bridge Station and the construction of a new piazza outside the building). John Prescott (who was Deputy Prime Minister in 2002 when the planning decision was made) called in the planning application and it was approved by Mr Prescott after a planning enquiry. 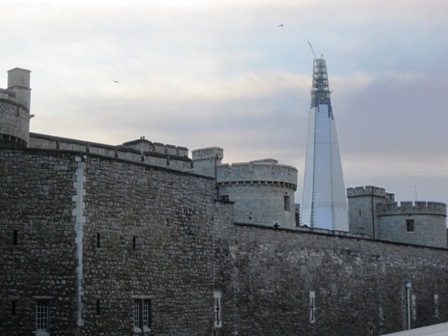 UNESCO is reconsidering the status of the Tower of London as a World Heritage Site because of the tall buildings around it and the Shard may be the final nail (or sliver of glass) in the coffin (see picture below). There are also issues about whether the local infrastructure will be able to cope with the massive increase in footfall that the building will generate – for example many of the pavements in the area are very narrow and congestion is already a problem at peak times. Love it or leave it you can’t get away from it!